Discover the relevance of bulk oil and fluid inventory control for service shops and industrial application. Fluid management is about solving the five W’s" concerning your fluid inventory - track who performed a fluid dispense; what quantity of specific fluid was dispensed; where in the facility the oil or grease dispense took place; when it occurred and why. What is a fluid control or fluid management system? In the diverse environments where bulk fluids are handled and especially in the lubrication industry, a fluid management system is comprised of different fluid control components which meter, monitor and dispense oil and other lubes. Technicians dispense an immense amount of bulk fluid which makes it very important to keep it in check, whether on the field, workshop or fleet service centers – every drop matters. A number of components while not technically part of the fluid management system, are critical to dispense and fluid control. Among these is a reliable pump, such as a Graco Fire-Ball® 300 Series oil pump. The pump, along with hose reels, diaphragm pumps for waste oil evacuation and other material handling equipment, are central to the actual dispensing and disposal of the materials being monitored by the fluid management system. 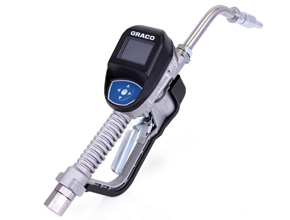 With Graco fluid Management systems, the only components necessary for functioning are a wireless Hub coupled with a Smart Dispense Meter. Our products/solutions are already compatible for programming and integration with popular ERP or DMS systems for data sharing, work order analytics and reporting in real-time. The detailed dispense history provided by fluid management systems can help shop managers in visualizing production and discovering patterns or workflow roadblocks, optimize material deliveries and reduce parts room work and errors. Effective fluid management systems provide parts managers with the information necessary to order enough fluid at the right time as well as the ability to recall transaction data. With inventory available, technicians have less downtime and are able to service more vehicles. Benefit offered by fluid management systems is that metering can ensure the dispense of precise volumes, avoiding costly mistakes. Effective fluid management systems provide parts managers with the information necessary to respond to the 5W's; who dispended fluid; what quantity of specific fluid was dispensed; where in the facility the dispense took place; when it occurred and why. 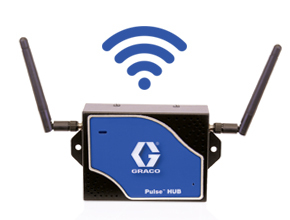 Since the 1990’s Graco has produced equipment for bulk oil control and fluid monitoring: from the first Horizon™ fluid management system up till our next generation solution - Pulse™.